We always enjoy running into other geocachers on the trails and decided that it would be nice to have a cache that guaranteed meeting someone... so here it is! A 'geocacher' is a single geocaching user account. So in our case, although we have a family of 4 geocachers, we count as a single geocacher for the purposes of this cache. - if there are more than 3 geocachers, then a new 'team' must be formed to log the cache (ie. each find must happen in groups of threes). - you can't participate in a team more than once. This is to ensure that not always the same people are called upon to find the cache and to maximize the socialization aspect of this cache. The cache setup contains a single redirect in the form a waypoint projection and digital roots which we hope will be simple enough for the oldies but teach the newbies some tricks with their GPSr. The FTF prize is some Tim Hortons certificates... maybe the first to find team will want to plan to go out for coffee afterwards! OK, now that the rules have been established, meet at the posted coordinates where you will find a sign. Memorize the bird calls of these birds listed on the sign: pileated woodpecker, yellowthroats, and white-throated sparrows. This will be important later. Note: we only had an accuracy of 10m when taking the readings, but hopefully the encoded hint will help you if you have troubles finding the cache. Project along the distance and bearing to get to the cache (the last 50m takes you off the trail). As you approach ground zero, each team will have to make one of the bird calls you memorized. This will keep muggles in the vicinity convinced you are just whacky birders and get the birds to help you find the cache. 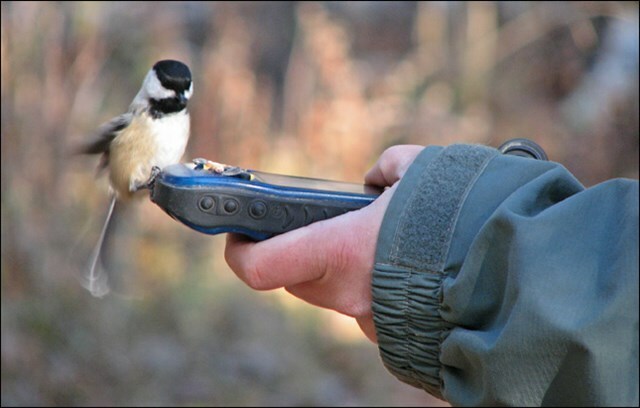 We suggest you also bring bird seeds to feed the chickadees... the attached photo is proof that these birds are excellent gps navigators and their help may be invaluable on your quest. If you go to the Canada's Capital Cacher's web site (visit link) there are links to users statistics and a forum section which should help you figure out who you could team up with or post a message asking for team volunteers.